For some reason darkness always seems to help soothe people when they’re highly stressed out. Everyone has their ways of embracing it, be it by turning out the lights and sitting in silence or to even cover their eyes for a few minutes. Now whether or not this eye cover is something that’ll help or annoy you further is of course a personal choice. However, a little soft fuzzy material over your eyes and some soothing music and it could be a great way to unwind. 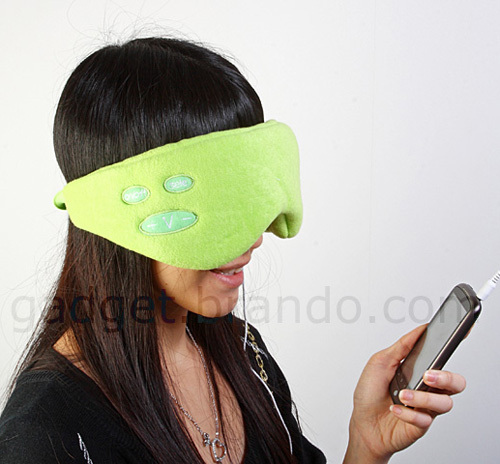 These eye covers attach to your head with an elastic back strap and then on the part over your eyes it uses a soft cloth. As far as the electronics go, it has built-in nature sounds, a line-in 3.5mm jack plug and built-in speakers. In order to keep it running it needs 2 AA batteries. You can purchase it in grass green, aqua blue and rose pink. To pick one up it’ll cost you $16 through Gadget Brando.